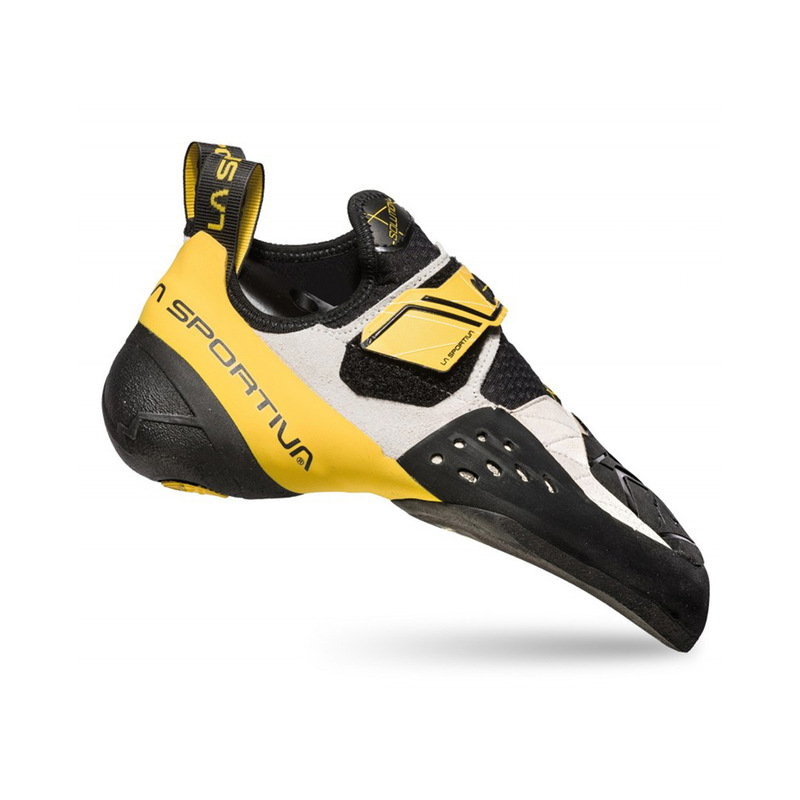 The La Sportiva Solution is an aggressive, unique, and high-performing climbing shoe that is designed for modern bouldering, overhanging sport routes, technical face routes, and gym climbing. The La Sportiva Solution (the "solution to all your problems", as La Sportiva say) is pretty ubiquitous amongst boulderers and in climbing gyms. The main difference from other high-performance shoes by La Sportiva is that the Solution features a medium-stiff midsole which will provide extra support on edges and longer boulder problems. But other features include the Lock Harness System® that wraps around the heel of the foot for extra security on heel hooks and blocks, as well as the Fast Lacing System® for a secure fit that doesn't restrict the movement of the shoe. The patented P3® rand system also maintains the shoe's powerful downturned shape for longer! Classic Shoe, Classic Fit, Stellar Performance! 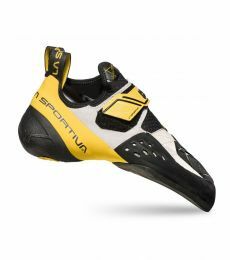 The La Sportiva Solutions (mens) are a game-changer for my climbing exploits. The Vibram XSGrip2 rubber is thick, yet responsive – it smears well, it edges well, and it wears well. The sock-like fit of the Solutions and the Velcro fastening system coupled with the way the lacing is positioned gives me a precision fit. Once the leather upper is broken in, the Solutions mold to my feet and give me the best bouldering advantage short of my. climbing ability that I could have! Great for sport climbing, too! These are my all-around, go-to shoes from La Sportiva, and they're great! I have had 7 pairs of solutions, they are just perfect for me. New version looks even better than earlier. I used the previous version of Solution too, and I can tell that that this product is even better. It perfectly suits to my feet, and it gives the same performance that the previous. The velcro seems more stable and the lace in it is a little bit wider so I hope it will last longer. The shoe is pretty comfortable and if you choose the right size you will get used to it pretty quickly. For me this is the perfect shoe. those are the best climbing shoes for bouldering!!! Shouldn't have updated the shoe. The old version was excellent and would fit on my foot perfectly, however, the new version just doesn't seem to be as snug, and I can't rely on as small footholds as I would in the old solution. I took a smaller size for a snug fit, and it really delivers!. Little to no give in the heel when placing heel hooks, although depending on how small your shoes are, the downturn may make toe hooks painful when wearing them for prolonged periods of time (make sure to take them off between climbs). This new version has improved straps which were a pain point on the previous model. All in all a great pair of climbing shoes! the best shoes for me! a lot of sheos look and feel akward at my big feet (45), but not this one. One on the tip of the toe may fit soft compared with a older model. I recommend it, but sometimes i feel it is not the best for extremely small footholds. I use the solutions as my main climbing shoe. They are surprisingly comfortable (my street size is 43.5 and my solutions are 41) and they perform well on most forms of climbing with the exception of slabs where they sometimes feel a bit awkward compared to my Miura's. The only real issue I have with the shoe is that the heel feels loose and is not very suitable for heel-hooking onto small holds. My go-to climbing shoe for everything. Fits perfect on my heel and feels especially good in steep terrain. Durability is also much better compared to my Miuras or Tarantulas. I climbed for the past 2 years only in Solutions and for me they are the best shoes i ever tried in more than 10 years of climbing. Very technical, high end and comfortable climbing shoes. Maybe not recommended for the first 1-2 yers in climbing. Verty good on slabs, vertical terrain and also on really steep routes. they go very well on indoor bouldering but i was mostly saving them for outdoors. As for sizing i have 28 cm and i best climb with 40,5 Solutions. I climbed in them for 3 sessions now and I really like them so far! Really good for a sport climbing, but it can be a bit painful after one hour bouldering section. Solutions are one of my favorite la sportiva shoes. They perform best when pretty tight (in my opinion). I use a 46 street shoe and a 43 in my solutions. They are not my choice when running laps or bouldering circuits, I save these for the sending goes when I want that extra precision and extra reach. Great for heel hooks and toe hook. Great for steep terrain and surprisingly really good in more technical grounds too. I find their soft rubbers works wonders in Freyr soapy footholds. I love the velcro since it makes it very easy to get them on and off. However it might also be their only downside, the strap wears off over time. I did not get to resole my last pair because the strap was about to break. In any case, terrific shoe! Within 10 weeks this shoe fell apart, the rubber peeled away and was clearly a manufacture fault... The dealer has ignored me and also la sportiva team has ignored me. Zero customer service, absolutely shocked that both companies ignored my e mails about the shoes. 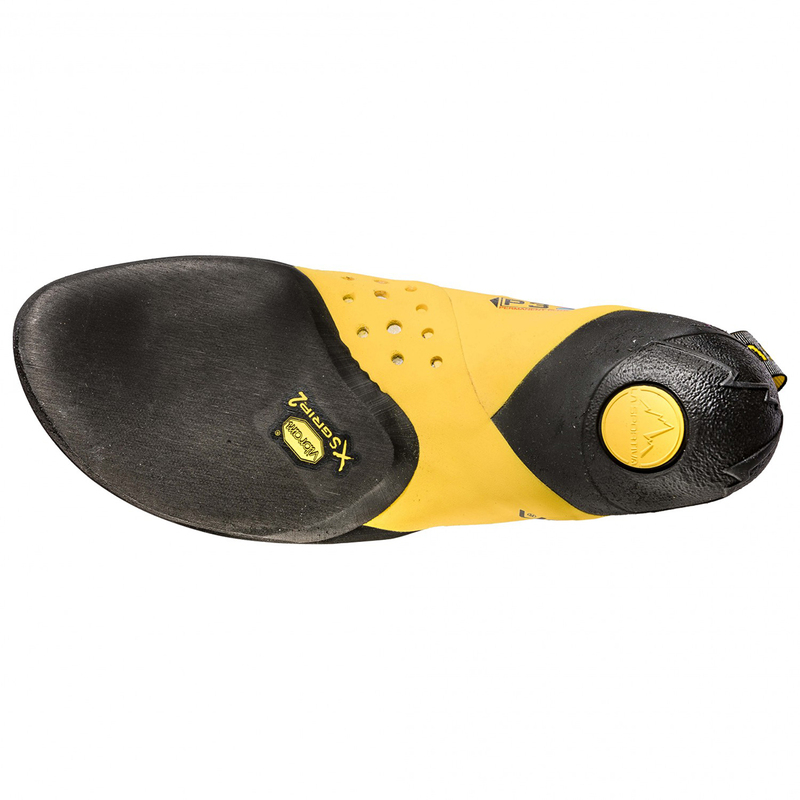 Steer clear of these if not for the fact they could fall apart after 30 climbs the fact that if you have an issue with anything La Sportiva will ignore your issue as they don't give a damn about customers. Buenos gatos para cualquier tipo de escalada. i took these shoes after la sportiva miura vs and it is a big diffrence in favor of solution shoes. Even if i took a half size smaller then miura the break in time was much shorter. The grip is fantastic i read it somewhere that you almost feel like cheating when wearing them and i say that you are actually cheating :))) . The precision you have with the tip toe is outstanding i missed a grip once and i stayed on a screw hole on the panel and i realised this after a while. I would definetly recomend this product. it´s the first time i´m trying this shoes and i´ve to say that i´m really amazed with them. All the people suggest me to buy this shoes since i´d improved my climbing level as a consecuence i need a more technical shoes. I´d tried other shoes but noone fit in my feet as well as La Sportiva solution. When i climb with this shoes i fell a kind of precision i´ve never feel before. not only the heel´s adjustment it´s perfect but also the tiptoe give you an incredible reliability. this give you a great confidence in your feet and this is essential to climb your best. 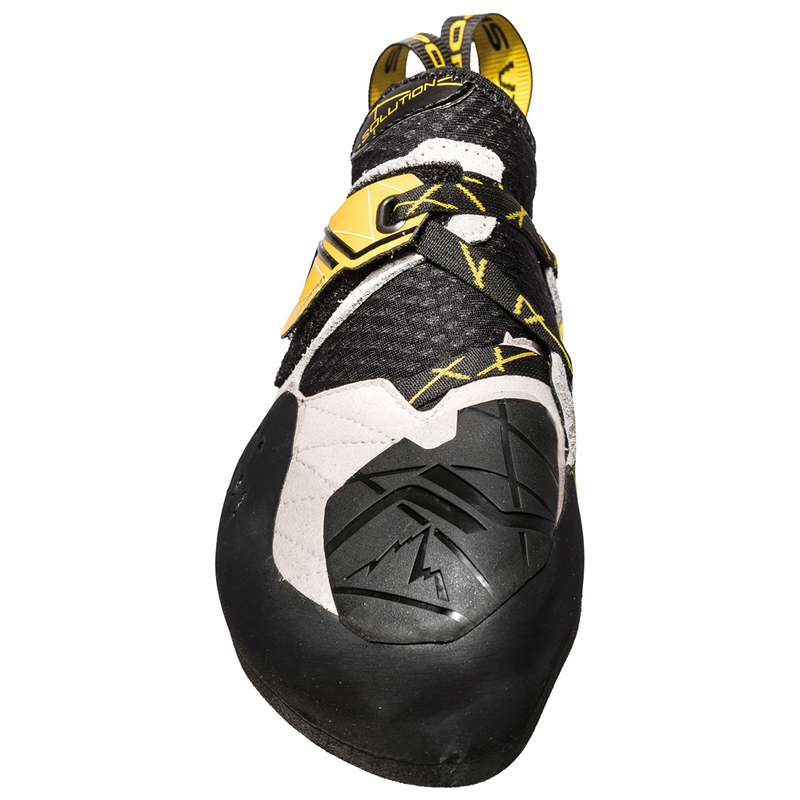 This climbing shoes because of their characteristics have a great polyvalence, it will give you a solid performance in great overhangs allowing you to use heel hooks and toe hooks, feeling as you´ll break the hold rather than lose it. Also this shoes will give you an incredible precission in slabs with small foot holds. The rubber of the sole give you a perfect friction and the characteristics allows you to resole them if you need without lose precission, it will give a longer useful life for your shoes. All this things makes La sportiva solution doubtless the best climbing shoes i´ve ever tried and i´ll repeat over and over again. When I got these shoes I was about a year into climbing and had been using clown shoes to entertain the regulars at my local climbing gym. I needed something that would allow me to stand on very small edges and allow me to heel- and toe hook without slipping. First time trying these shoes, my feet immediately cramped. I had never worn shoes this tight before, so I began to slowly break into them by putting them and off every 5 minutes. The first couple of weeks were pure pain, so I would recommend not choosing these shoes as your second ever pair of climbing shoes but rather something like the la sportiva muria as an intermediate. Even with the pain, I did feel an immense difference to my previous climbing shoes. The shoes are very aggressively downturned which allows you to use the very tip of your toe to stand on incredibly small footholds. Secondly the outer edge of the shoes work very well once you get a little accustomed to the shoe, making movement I didn't think existed possible. The most important difference I realised from day one was the heel. This thing is machine in that category. It sticks almost anything and you can generate a tremendous amount of force even on the smallest of holds. Due to the shape of the rubber, the heel barely slides allowing for very comfortable heel hooking while pushing hard. On rawk, this shoe performs quite well in terms of keeping rubber on the shoe, however after you will notice some damage after a while which are pretty unavoidable given how the shoe is built. Regarding problems, the only I can think of is the strap of the shoe. As the strap is pretty thin to begin with it start to erode more and more through the months and might even break at some points. That's something la sportiva really gotta work on, as it deems the shoe unusable afterwards. All in all though, the shoe has helped me quite a lot, went from 5a to 7a boulder in this without having to buy another shoe. If your style of climbing revolves around campusing and heel hooking, this shoe is bae. The La Sportiva Solutions are about as good as it gets! I've had a couple of pairs and I can definitely say the following: You do not replace a winning racehorse. I've tried other shoes afterwards but I just cannot compare anything just yet to the Solutions. The classic Italian bouldering shoe provides high-end edging ability. The toe-box sets the fingers in the perfect position to grab onto the wall, and the heel of these will keep you hooked! Sizing: I wear 46 (EU) street size. I found the size 42 best for high performance bouldering, and the tad more snug 43 for sports-climbing and bouldering altogether (just have to close them more tightly for the heel to not slip away). Wear-out: An average of 14 months of activity with each pair. And this is coming from a guy who tends to kill shoes very quickly. The rubber does become more soft after a while, but the edging point of the shoe takes a long while to break. Overall this is a great shoe! I'm usually a 40 in Scarpas but have gone down to a 38.5 for these and they're still fairly comfortable! I've only worn these indoor a couple of times but I've not had any problem on slabs or on roofs. The only slight problem (if it's a problem) is that the heel is really really stiff so you don't get the same sensitivity as I do with my boosters which have a slightly more flexible heel! Overall, a great shoe! what can i say? i upgraded to the Solution from the Katana laces, which was a perfect fit and super-comfortable to me. the more aggressive Solution was a tat painful at the beginning, but immediately bumped up my bouldering footwork on small edges. after a couple of weeks they start to feel much better as well. the only niggle i have is that the heel isn't perfectly snug for me. for my type of foot there is the tiniest airpocket back there, and it doesn't seem ideal for heel hooks. but other than that: perfect shoe for nasty boulders! This is my 5th pair of the Lasportiva Solution. For me it´s the best allround shoe I´ve been climbing in so far. I know it sounds strange being an aggressive downturned shoe, but here´s why. Cracks: Medium soft rubber grips the edges of the cracks, medium stiff sole lets the shoe conform to the crack. The shoe is really well built, and I guess they fit me feet really well, so to me they are super comfortable. BUT: I once sized it half a size up, and my foot kept turning and slipping inside the shoe (sweaty feet), so make sure to fit them tight enough. AND the rubber on the sole tends to peel and "roll off" the rand when crack climbing (sooner than on other shoes I feel). If I were to only climb in one pair of shoes, it would have to be the Solutions. Size-wise, I go: Solution: EUR 42, Miura VS 42 (just a little bit tighter), Miura Lace 41,5 (a little bit tighter), Futura: EUR 41,5 (a lot tighter), 5.10 Anazasi Lace EUR 43 (quite loser). I usually wear miura velcros which I love, was looking for something a tad more sensitive. Solutions are just amazing. I up-sized by 1/2 a size compared to miuraVS, they fit straight from the box and managed 2 hours at the gym first go. Very painful to begin with, I bought the smallest size I could squeeze my feet into, but after a few sessions they've started to wear in and the results have been great! Would really recommend them if you've been climbing for a little while and want to take things up a step. Service from Epic TV shop was great, ordered Friday evening, arrived the next Wednesday. What can I say which hasn't been said before? Awesome high end all round shoe. Soft, but holds an edge. Heel, hasn't got 'feel' to it, but you know if its locked on and you can pull on it. I find that the sold heel protects you from the sharper heel hooks - personal taste, as i'll admit, it takes some getting use to. I'm now on my 4th pair, tried other shoes but always return to these for my hard ascents and comps which i think speaks volumes. Size wise - drop 2 street shoe - I'm a 43 and wear either 40.5 or 41 - not a huge different. I struggle to see how they are going to replace/improve these as they have hit a good sweet spot between soft and some edge support. 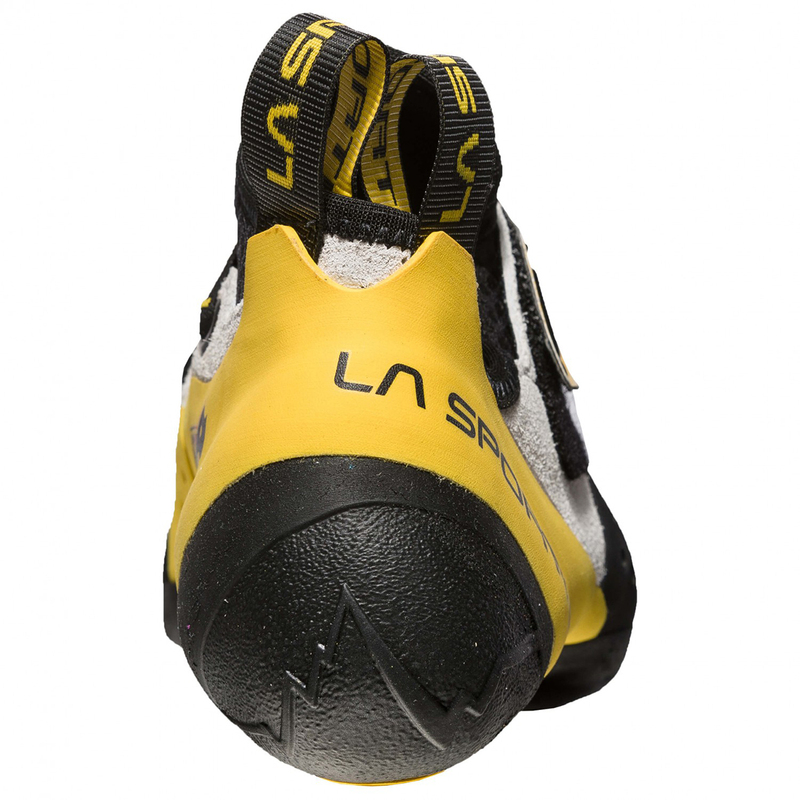 I have had the La Sportive Solutions for a couple of weeks now and although I have only used them for indoor bouldering so far I’ve been very impressed. They are an aggressive shoe which are of course great for steep problems they are still excellent on slabs and comfortable. The toe rubber also makes them a lot better for toe hooking compared to my previous shoes. The soft lining on the top makes them a lot easier to squeeze into and I think they would be fine all day at the crag! So far I can’t fault them! They do come up quite large though so I ordered a size smaller than my previous Scarpas. Very quick delivery and the cheapest price for these shoes I could find on the internet. Unfortunately the shoes I ordered were slightly too small for my feet. However, the shoe itself is clearly of a high quality with a quick and easy velcro closure that is easily adjustable to get a good fit for your foot shape. I did manage to squeeze my feet into the shoes but they were uncomfortable on the toes, dispite this the heel was a snug fit that I'm pretty sure would have been good for heel hooking. I have wide feet and these shoes accomodated the width really well without feeling like my feet were being excessively squashed. I usually wear a UK 8 street shoe and i think that a size 39.5 would be just right for my feet, it does go to show how important trying on shoes can be if you have not worn them before. The shoe is very aggressive and has a substantial down turn that looks like it will be as good on steep terrain and small holds as the La Sportiva say it is. Epic tv shop make returning items easy by filling out a simple form which you can easily find on their web site, print out and return with the item. I've gone through 4 pairs of Solutions. This is my favourite shoe based on performance, durability, and looks :) I also own Miuras, Katanas, and Mythos, but when things get serious I always default to the Solutions. I once heard Chris McNamara say that using this shoe sometimes feels like cheating because it allows you to climb so much better. I completely agree. An additional note on the exceptional customer service provided by Epic Tv: I received my shoes and noticed one shoe was bigger than the other (same size, just a manufacturing issue). I emailed epic tv (with photos and description) and Carlos Abraldes followed up with La Sportiva. Within 2 weeks I received a brand new pair of shoes. Thanks a lot Carlos and La Sportiva! The 'Solution' to all your problems! All round my favourite shoes. Great edging, a toe and heel you can really trust on small edges. Lovely sticky rubber! The rubber on the heel is quite thick, so not very sensitive. I find they stretch quite a lot, so I buy them about 2 European sizes smaller than my normal shoe size. If you have skinny feet the strap can be a bit long to get them tight enough. I've had a few other different shoes but I always come back to these. I've tried a lot of different shoes over the years and the solution are the ones that fit the best my feet. I have rather thin feet and sometimes my heel comes off my shoes but not with this model. Fast shipping and lowest price I could find, thx Epic TV! This is my second pair of solutions and i absolutely love it, it is a great shoe for precise footwork and is an all purpose great shoe for bouldering (indoors and outdoors). The only downside is when it comes to smearing, i prefer using my other pair of shoes such as the katanas. Highly recommend. Very good for bouldering, very precise to stand on the smallest edges. Regarding the fit, I initially thought they were giving a lot so I had downsized aggressively (same as the Katanas, from 42.5 street shoes to 39) but then ended up buying a 39.5, which remains anyway pretty tight. When it comes to practical use in the end though, I find myself going for the softer Furias from Scarpa on very overhanging walls, whilst on vertical walls I still prefer the Katanas which offer the same support of the Solutions whilst allowing better smearing. Best price ever on the web for La Sportiva Solution on EPIC TV. Received in one working day . Simply great !